What happens when 22,000 urbanists descend on your city for the biannual World Urban Forum? We present, we dialogue, we attend high-level sessions, side events, training events, and networking events. Maybe most importantly, we benefit from the open exchange of ideas and personalities that you can only get by meeting in person, providing renewed inspiration for our work. But what’s most satisfying for many of us? Exploring. 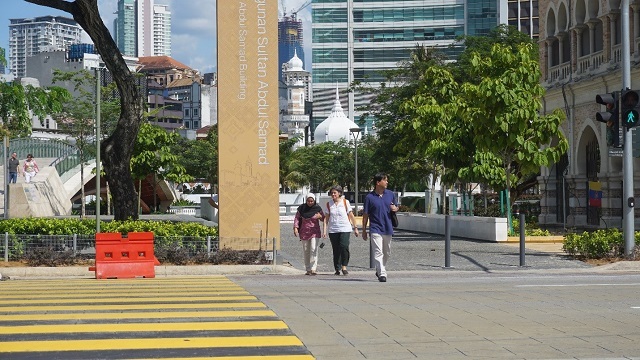 Beyond the convention center, where WRI Ross Center experts from around the world contributed to the conference, UN Habitat organized a number of events and exhibitions scattered around Kuala Lumpur. 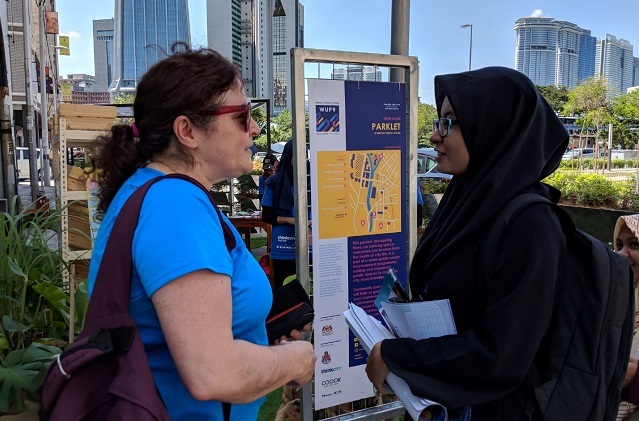 We saw some of the growing pains of Malaysia’s capital and largest city, with more than 7 million residents, and we found pop-ups that invited passers-byes to contribute ideas about the future of KL. The sprawling city serves as a hub for international companies such as BMW, Motorola, and HSBC, and has attracted talent from near and far. The iconic Petronas Towers dominate downtown, but they are not alone; the tropical skyline is dotted with many towers and new construction. Some 30 major buildings are expected to be finished in the next five years, including the 118-storey Warisan Merdeka. The city museum, located in the historic district, featured a short video and installation depicting this progress, pictured below. But such rapid growth has not come without costs. Traffic is notoriously bad in KL, especially in the city center. “This is a car culture,” we heard from locals. Like many other rapidly growing cities, to modernize and spur economic development, planners have sometimes overlooked the details of transport design. 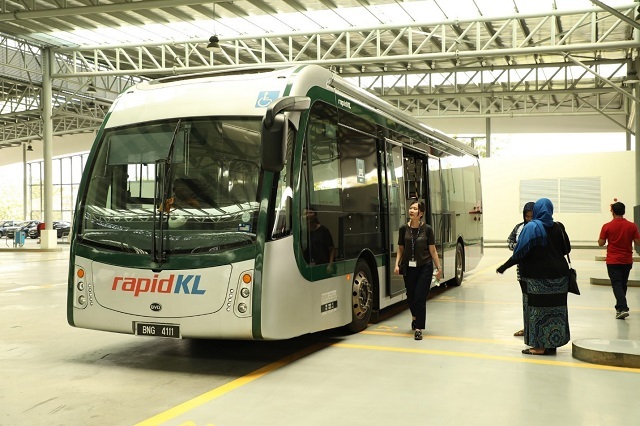 There is a bus rapid transit line, a light rail system, a monorail and integrated stations. But in a tour of the BRT system for WUF attendees, operators admitted transit ridership was not what they’d like. Poor signage and design also leads to some dangerous and frustrating pedestrian experiences, from crosswalks that do not line up with the crossing light or curb exit, to narrow, fenced off sidewalks that leave you hunting for safe spots to cross the street. 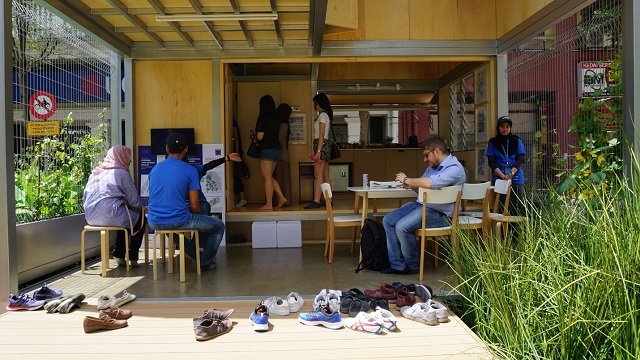 Small pop-ups run by local university students gave a glimpse of the next generation of planners. Nestled around the city were “parklets” – parking spots turned into green spaces. 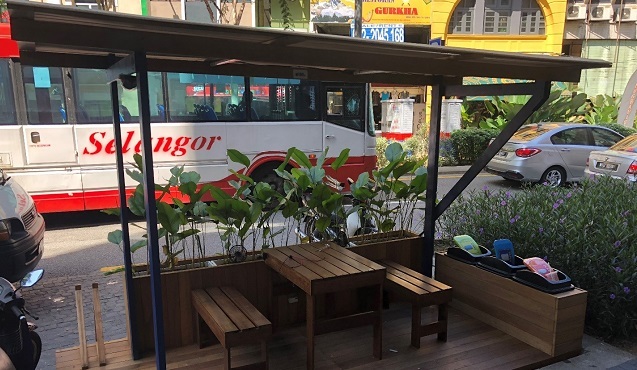 The parklet below featured a solar-powered phone charging station, space for people to find shade and fans, and recycling bins. These spaces created not only a fun and inviting environment, they represented a vision of a kind of participatory, people-oriented development. Staffed with students and packed with feedback forms, they drew WUF participants and city residents to consider a greener future for their cities. 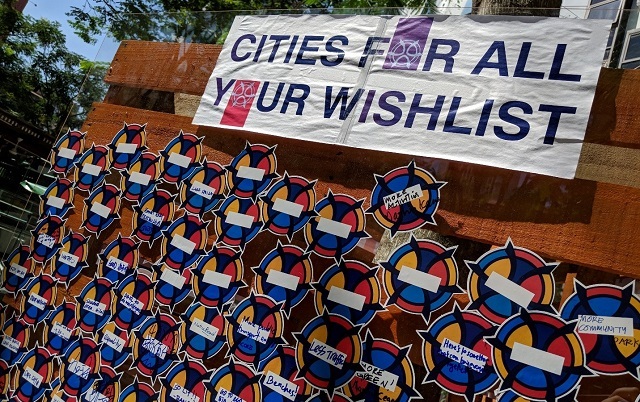 One of the pop-ups featured a “cities for all” wish list, where people posted ideas for their own cities and KL. Among many compliments about the host city, suggestions included better sidewalks, more trees, and benches. “Cities for all” was the overall theme of WUF9, echoing our framing of the “World Resources Report: Towards a More Equal City,” which explores ways to provide adequate and equal access to core services, like housing and transport, for all. 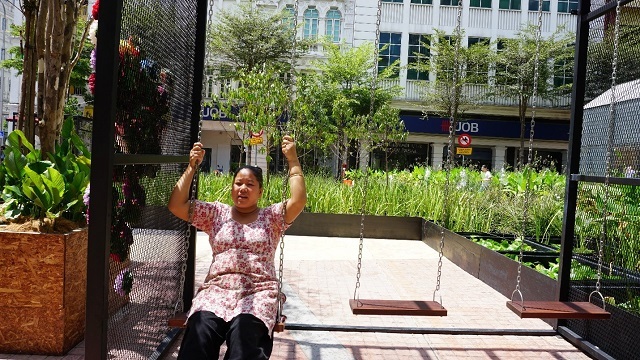 In Medan Pasar, a historic meeting place in Kuala Lumpur, a micro-housing installation demonstrated ways to accommodate population growth and highlighted the importance of smaller housing footprints and higher density. Perhaps as salve to the idea of living in such tight quarters, the same exhibit showcased green, interactive public spaces. 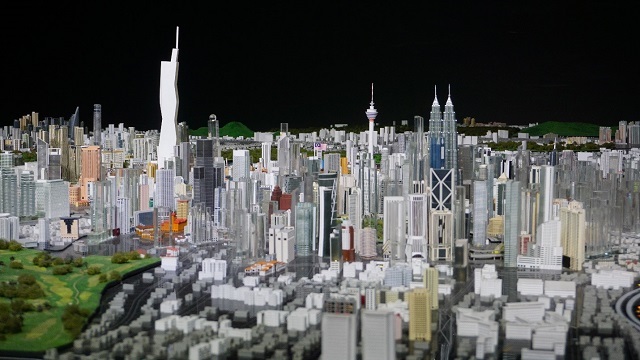 Similar to many of the cities we work with around the world, Kuala Lumpur is a fast-growing dynamic place with a mix of both unique and somewhat universal challenges. Exploring the city on foot and talking with its young planners-to-be gave us a unique perspective. It also made us want to stroll back through these streets in the years ahead to see which of these ideas have taken root in the urban form. Adna Karabegović is Project Coordinator, Research Tools and Economics Team at WRI Ross Center for Sustainable Cities.